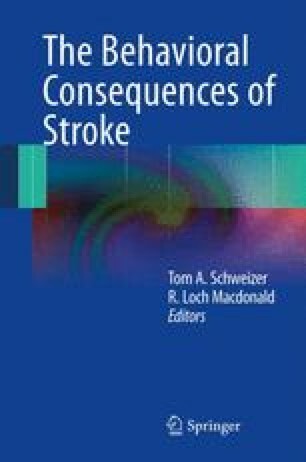 A common consequence of right-sided brain damage is the syndrome of spatial neglect, which is seen in 40–90 % of patients in the acute phase after stroke [1–4]. The disorder is a debilitating one in which patients fail to attend to stimuli in contralesional, left space [5–8]. Patients with neglect typically require assistance with most activities of daily living and often fail to dress or groom the left side of their body, leave food uneaten on the left side of a plate, and bump into obstacles on their left. In this chapter I first describe the “classic” case of neglect before describing recent work painting a more complicated picture of the constellation of deficits making up the syndrome. I will then review the recent debate regarding the critical lesion site for neglect before discussing recent rehabilitation attempts. The past few decades of research has shown that neglect can no longer be characterized simply as a disorder of attention.